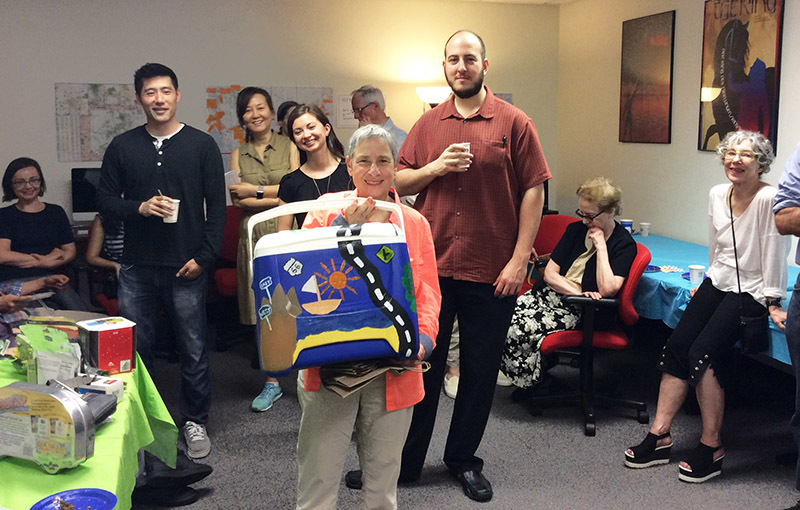 Photo: Bonnie shows off a gift at her travel-themed retirement party. This interview was published as Bonnie Nelson, Associate Librarian for Information Systems, retires. In 1980, John Jay’s president, Gerald Lynch, needed information about the potential for corruption in casino gambling in New York. Chief Librarian Eileen Rowland excitedly told him about a wonderful new way of searching literature, and she tasked her newest librarian, Bonnie Nelson, with helping the president with his research. Lynch visited the library, still wearing running shorts from his morning workout, and sat with Bonnie as she used an acoustic coupler with a dedicated “dumb” (unconnected computer) terminal, dialed a phone number, got a tone and put the handset in the cradle attached to the terminal so the terminal could communicate with the mainframe located in some faraway location. All that before she could even begin a (very slow, 300 bytes/second) search using precise Boolean language and controlled subject headings in Dialog, just to come up with a list of bibliographic references (maybe abstracts if she was lucky) to print out and then locate on the library shelves or on microfilm (if she was luckier). It sounds cumbersome and archaic now, but Bonnie was at the forefront of library technology. As a Bronx High School of Science student, she had taken take a class in computer programming. That minimal knowledge marked her as a semi-expert, allowing her to get hired as a librarian at NYU where they were implementing a new computerized circulation system. “It was tough times in 1973,” says Bonnie. “Nobody was hiring. They were firing. I was lucky to be hired at all, anywhere.” She played an important role in getting that new system underway and also did reference (of the mediated type described above). She stayed for almost seven years, and was the first librarian to come up for tenure as they had just been granted faculty status. “[NYU] decided everyone needed a PhD,” says Bonnie of the tenure requirements. “And should have written a book or something. I was the test case. I was pretty young and they didn’t want to make a commitment to someone so young.” But more to her credit, she revealed a trait that would serve her well later on: “I didn’t know enough to keep my mouth shut at faculty meetings.” Combined with the overly stringent requirements and an austere economy, the stars were not aligned for Bonnie to remain at NYU, and she was not granted tenure. “It was a rich person’s university,” says Bonnie, admitting that she had not been completely comfortable there. NYU’s loss was CUNY’s gain, where she clearly found her niche and remained for the rest of her library career. Sympathetic to the causes, Bonnie was easily caught up in the spirit of activism all around her. “It’s what everybody was doing,” she says. A year or two after the open admissions protest, New York State raised the minimum wage, but she was a student aide in the library, making even less than a college assistant, and CUNY was not required to pay student aides minimum wage. She was one of the co-organizers of a one-day strike in protest. A few months later, the aides received their deserved increased pay. Bonnie’s family was not particularly politically active, but in high school, she says, “I was mentored by a fellow student who was much more radical, and she educated me about what was really going on in Vietnam, and so I started tentatively taking steps towards demonstrating against the war. And then in college, I met my husband [Bob Nelson, later Deputy Director of Student Services at the Graduate Center] when I was a freshman, and he was pretty left wing, came from a left wing family, and he continued my education.” Her family eventually came around, too, “as the rest of the country did,” says Bonnie. A self-described bookworm as a child, Bonnie frequented the public library in her northeastern Bronx neighborhood. “Though I never spoke to a librarian other than to get my library card,” she confesses. She actually had some librarian training before she started at City College. After high school, her mother enjoined her to do volunteer work, so Bonnie headed to Montefiore Medical Center thinking she might be interested in the medical field. On the way to her interview, she passed the patients’ library and spontaneously told the volunteer coordinator she wanted to work in the library, which she did for the summer. As a student at City College, she worked as a staff member in the library for four years. She was an anthropology major but not too keen on the idea of conducting fieldwork in exotic locations for the rest of her life, so she decided to go to library school after college. It was this unusually early start in the field that allowed her such a long library career. 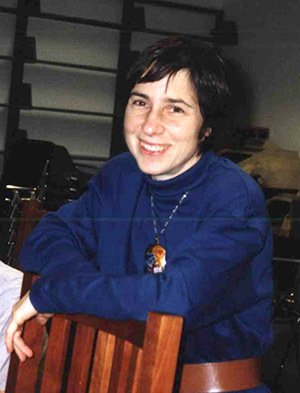 During her time in the library science graduate program at Columbia University, she continued working at the City College library where she mostly did reference work. After library school, while working at NYU, she also obtained a second Master’s degree in Anthropology (starting at Hunter and finishing at NYU). “I didn’t expect to wind up at a criminal justice college,” says Bonnie. “I had no interest in it and knew nothing about it. I thought, well, it’s a job for a few years and we can pay the rent.” Her experience at NYU starting the new computerized circulation system was attractive to Chief Librarian Rowland at John Jay where they were also implementing a new system—using punch cards. “That was old technology even at the time,” says Bonnie, “and they were desperate to have someone who knew something about computers.” Like most faculty who come to John Jay with little background in criminal justice, Bonnie got interested quickly. She vividly recalls helping a forensic science student, who later went on to work for the medical examiner, do research on blood spatters. “And I helped someone in fire science find out the temperature at which blood boils. They needed to know how hot was too hot for firefighters to go in before blood could no longer deliver the oxygen. There were these very gross searches, and I thought, wow, working at John Jay, this is really different!” She also began to stay abreast of crime stories in the news since she knew she would be asked about such subjects at the Reference Desk. After nearly four decades here, Bonnie is well known for her active role in PSC-CUNY. But despite her early days in activism at City College, she was not a union crusader right away. For her first few years, her time was occupied by trying to publish and get tenure. Junior library faculty at that time got no automatic reassigned time but were eligible to apply for special two week reassignments for research. After being granted tenure, she had her daughter, Miranda. Jim Cohen, Public Management faculty (now emeritus) and chapter chair, asked if she wanted to be more involved in the union, and she said, “Ask me again when my daughter is more independent.” A few years later he did. She served as an alternate delegate and was then tapped to be secretary. “I was very good at taking notes,” she says, and she discovered that distributing notes of Labor-Management and Chapter meetings was actually critical to helping colleagues engage with the union. She also spent years on the PSC Delegate Assembly Library Faculty Committee. “Working with the union and librarians in the union and helping the union to understand librarians are just like other faculty but a little bit different,” she says. She was “in the troops” with other faculty librarians to advocate and win the two additional weeks of annual leave for librarians in the most recent contract, bringing library faculty closer to the parity they have long sought. One of the things I’m most proud of is the work I did here, and CUNY-wide, in keeping the enemies of academic freedom at bay. At John Jay, we have probably the best relations with the college IT department of any CUNY school. Bonnie considers building the Library’s IT infrastructure—both equipment and personnel—to be her most important contribution to the library. With the support of all three of the chief librarians with whom she worked, she made sure the library controlled its own equipment and content. After the then-head of the Microcomputer Lab tried to edit the library’s web page on the brand new John Jay College website, the Library developed one of the first library websites in CUNY. “We did it by hiring an NYU student who built us a webserver on an IBM desktop and wrote web pages in basic HTML,” Bonnie recalls. That interference by John Jay’s IT department was an aberration, however, and generally relations with DoIT have been constructive and mutually beneficial. “I’ve been lucky that throughout my time at John Jay key people in DoIT have understood that robust library IT infrastructure is critical to the academic success of both faculty and students,” says Bonnie. “We have probably the best relations with the college IT department of any CUNY school—based on years of building trust.” Bonnie said that this allowed her and her staff to build what was needed to provide access to remote library resources from on campus and off—for many years providing better service than was available almost anywhere else in CUNY. Following those early years of reliance on part-time student help and as IT became more complex, Bonnie increasingly turned over the technical aspects of the job to highly-skilled adjuncts and then to specially-educated HEOs (currently Geng Lin) and librarians (like Robin Davis) as she coordinated in her role as Associate Librarian for Information Systems. One of her most salient memories from her early years at John Jay is a painful one. The Library (and the rest of the college) was located in North Hall, and her office was near the circulation desk. Late on a Friday afternoon in January 1985, Bonnie heard a thud and looked out to see Lloyd Sealy, a formerly high ranking NYPD officer and faculty member at John Jay, lying on his back. “He’d had a massive heart attack,” says Bonnie. She and another woman performed CPR, but he did not survive. It was his 68th birthday. Lloyd had always spent a lot of time in the Library, and students always knew they could find him there. Appropriately, he became the library’s namesake in a 1991 dedication ceremony.